Asparagine is a non-essential amino acid derived from aspartic acid, which is another amino acid. The body needs a particular molecule called adenosine triphosphate (ATP) to synthesize asparagine. ATP is known in the scientific world as the “currency of life” because it is a high-energy molecule that cells of all living things need in order to gain energy for the performance of everyday tasks. Once ATP synthesizes asparagine, the latter has the ability to produce ATP after the latter is converted back into aspartic acid. Asparagine is included in the list of 19 other amino acids that are considered the building blocks of proteins. It is commonly found near the beginning and end of the protein chain , and serves as the “cap” for the hydrogen bond. It is incorporated into proteins and enzymes at a rate of 4.4 percent on a per-mole basis in comparison with other amino acids. Asparagine is known by its other names that include alpha-Aminosuccinamic acid; L-Aspartic acid 4-amide; (S)-2-Aminoscuccinic acid 4-amide; and (2S)-2-Amino-3-carbamoyl-propanoic acid. You can gain asparagine by eating meat products such as beef, chicken, eggs, and seafood and non-meat products such as dairy, asparagus, soy, and whole grains. It is also abundant in plant proteins. 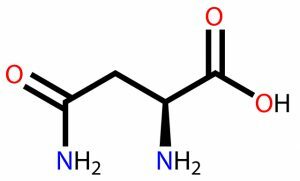 Asparagine plays an important role in glycoprotein biosynthesis and protein production, and is an essential element of proteins for the transmission, neuronal development, and signalling across nerve endings. It also aids in the transformation of amino acids from one form to another. Asparagine addresses the problem of poor metabolism. It also arms the body so that it is protected against stress and fatigue. Asparagine is an essential ingredient in many effective skin care products as it can replenish damaged or aging skin cells. While the presence of asparagine in the body ensures you of an abundance of health benefits, you must remember that taking advantage of the compound’s medicinal effects can only happen if asparagine is formed with the right set of amino acid chains. Therefore, you must have knowledge of the proper combination of these ingredients when looking for the right kind of supplements or skin care products. Asparagine is good for the excretory system. It fixes the body’s inability to produce and remove urea, which is an organic compound that is a major component of the human urine. It optimizes the function of the liver by metabolizing ammonia. Asparagine’s actions are important for the proper functioning of the central nervous system. It can help in maintaining balance and equilibrium of the mind and body, and provides for a person’s general state of well-being, thereby keeping the blues away. It keeps nerves healthy. Asparagine is good for the excretory and central nervous systems. Asparagine addresses the problem of poor metabolism. Asparagine is an essential ingredient in many effective skin care products as it can replenish damaged skin cells.